Sollertia is an accountancy business that was established to allow small to medium sized enterprises to benefit from cost effective, adaptable outsourcing of their accounting and finance requirements, at a fraction of the cost of hiring dedicated in-house staff. Sollertia needed to convey these concepts and market their services to their target market, as well as to develop IT applications that would support their business. Formability were contracted to develop the financial IT applications that could be used as part of Sollertia's online presence. Managing Director of Sollertia, Andrew Mault says, "We have now worked with Formability over a number of different projects, they have a can do attitude to every thing they do. Their work on Accounting Express was delivered on time and in budget, the portal has created an extension to our key services!" As Sollertia grew, Formability again assisted in the development of Accounting Express, a comprehensive online accounts service that's completely secure, Written with non-accountants in mind, it is incredibly user-friendly and straightforward to use. Formability built the program interfaces between their main accounting platform and the internet user. 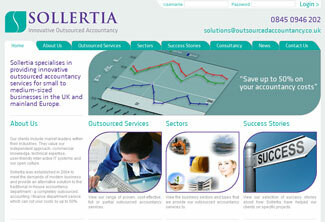 Most recently Formability worked alongside Wilson Cooke, a Manchester based design agency to help develop Sollertia's latest website - http://www.outsourcedaccountancy.co.uk. One of Sollertia's main requirements was to be able to maintain their website through the use of a Content Management System (CMS). We built the site using Joomla, an Open Source CMS. The site takes full advantage of the flexibility provided by Joomla through the use of articles, categories and sections. It also features many newer social-based technologies such as Twitter and RSS Feeds as well as providing users the ability to share pages of the site across social networks.